The Metrodata PA1000 converts data from byte-oriented HDLC, as used on Packet over Sonet (POS) interfaces, to bit-oriented HDLC as found on HSSI interfaces. Click for a quotation request. High-speed core router networks are moving rapidly into the SDH/SONET speed stack to meet the huge demands of IP networking. Core routers are now designed to operate most efficiently over fibre, from OC-3/STM-1 (155Mbps) through to OC-192/STM-64 (10Gbps). As products, they are technically removed from the current and earlier lower-speed applications aimed primarily at HSSI and PDH Networking. As the world migrates to IP traffic, data is increasingly being transported using HDLC frames, e.g. PPP, and POS(Packet-over-Sonet/SDH). 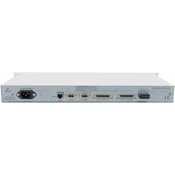 The PA1000 provides a solution for satellite operators wishing to use high performance Packet over Sonet (POS) based routers for example, Juniper routers with their standard 155Mbps POS interfaces to connect to a HSSI-based network without the need to use valuable chassis slots for low speed HSSI serial interfaces. The user thereby gains a migration path - to use the router on <=52Mbps initially, and later upgrade his access speed to full STM-1 155Mbps later, without any hardware change to the router. In addition, the PA1000 supports non-standard data rates and asymmetric operation, thus providing a flexible solution for the user. The PA1000 rate-adapts by stripping flags out of the data stream and transporting only the actual packet data. It is transparent to packet payload and may operate with any protocol that both the Packet over Sonet (POS) and HSSI devices support, such as PPP and Frame Relay. The PA1000 provides the system integrator with a simple, convenient and economic solution for the interconnection of modern high speed routers fitted with Packet over Sonet (POS) interfaces and older legacy routers with HSSI interfaces. The PA1000 Packet over Sonet port operates over 5km using multimode fibre, or either 30km or 70km using singlemode fibre. Despite these quoted maximum operating distances for the PA1000 products, specific installations may only operate over lower distances due to the variations in losses of different types of fibre cable, the use of connecting fibre cables, or patch panels. When operating over 50% of the maximum distances it is advisable to calculate all fibre optic connector and cable losses and compare these with the fibre optic loss budget specified for this product. The standard PA1000 is supplied with SC fibre connectors and operates at a nominal wavelength of 1300nm. Other wavelengths are available on request, e.g. 850nm, 1550nm, 1550/1300 WDM. Other connector options are also available on request, e.g. ST, FC. This application shows how PA1000 units can be used to enable a Packet over Sonet router to connect to a HSSI satellite modem. - To learn more about Metrodata products and updates subscribe to our occasional newsletter.